If you’ve been online this week, you’ve probably seen the latest news out of Syria: a chemical attack killed more than 70 and left hundreds suffering from serious respiratory problems. Like me, you may have been struck by the photos of how this chemical attack affected children. Children. No doubt, if you saw the images, you were horrified. You may have also been left with the question: But what can I do? Too often it feels like there is nothing we can do in the wake of such mass atrocities. But as Christians, we can’t afford to be hopeless. Because we are a people of hope. Since the war in Syria began more than five years ago, more than 250,000 people have died, and more than 11 million others have fled their homes in fear. Of course, those in Syria are not the only ones fleeing. Add to those numbers millions more in the Middle East and other world areas who are running from violence and persecution. When the problems of the world become too much to process, our natural response is often paralysis. We might think, I can’t fix it all, so there must be nothing I can do. Yes, it’s partly true that we can’t fix it all. And, sometimes our notion of “fixing” does need to be held in check. But that doesn’t mean there’s nothing we can do. None of us can do everything, but each of us can do something. In trying to explain the concept of grace, Frederick Buechner writes, “The grace of God means something like … ‘Here is the world. Beautiful and terrible things will happen. Don’t be afraid. I am with you.’” There is no doubt: what’s happening in Syria is the very definition of terrible. In the midst of the terrible, though, God is still present. God is still working. And there are beautiful things happening as well as the terrible. Many of those beautiful things are reflections of the work being done through the church. Lebanon and Jordan, which border Syria, are hosting more refugees in comparison to their populations than any other country in the world. And for years now, local churches in those countries have been reaching out to serve those who fled the war in Syria. In Europe and other parts of the world, churches are also actively working to provide biblical hospitality to refugees. In addition to meeting needs such as food for families and education for children, members of the body of Christ are also reminding people that they are precious in God’s eyes and they are made in God’s image. They are worthy of love, and they are loved. Of course, for those of us living in areas without outlets for active ministry, we’re still left with the But what can I do? question. 1. Look. When the only things we know are what we see in our news feeds, it’s easy to think only in terms of big numbers and big words like “crisis.” To find what’s beautiful and the ways in which God is at work, look for the stories that may not necessarily be front and center in your news feed. Look for the stories of the one person or family instead of the many. Look up poetry or music composed or written by migrants. Find art. Look for documentaries. Look for stories of transformation. You can start with just a few stories of people who have been touched by the work of the church: Lina, Tarek, and Lely. 2. Advocate. 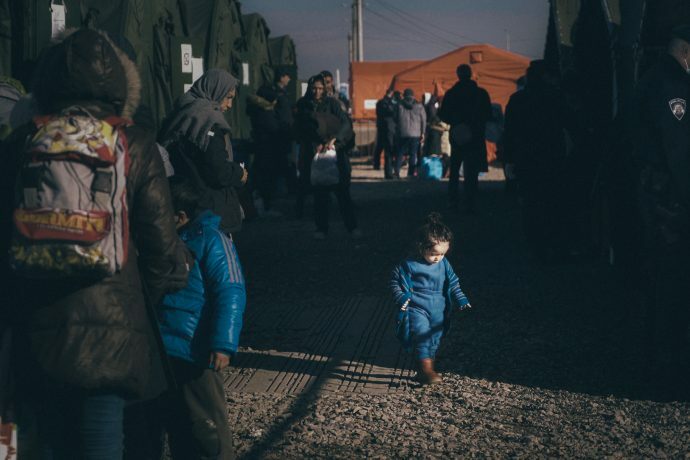 Engage in conversations about the crisis in Syria and what Scripture says about ministry to refugees. Help humanize the crisis by pointing others toward the stories you hear and the individuals and families you have read about. People often get paralyzed by statistics. Try to share stories about people and the good work God is doing through them. Encourage others in the body of Christ to participate in the beautiful ways in which God is at work. 3. Support. The church is engaged in ministry to those who are vulnerable and those who have been traumatized by violence and loss. The reality is that this work requires resources. Food, education, clothing, and other forms of care all require funding. If you want to give, Nazarene churches can use your support to sustain ongoing ministries to assist those who have fled from Syria. If you feel led to support action taking place in Syria, there are other organizations doing good work, such as Tearfund. 4. Pray. It’s easy to feel that in praying, we aren’t really doing anything. In those times, it’s good to be reminded that prayer and action go together. In the book Compassion, we are reminded: “Prayer and action… can never be seen as contradictory or mutually exclusive. Prayer without action grows into powerless pietism, and action without prayer degenerates into questionable manipulation. … In prayer we meet Christ, and in him all human suffering. In service we meet people, and in them the suffering Christ.” And don’t gloss over the suffering. Let yourself be angry or sad about it. The feelings and emotions we all feel are normal and important. They’re part of what connects us as humans. 5. Serve. Offer your time and talents to serve others in your local community. There may be a ministry to refugees in your area, but even if there isn’t, you can serve. Visit those who are sick or home-bound. Restock boxes in a food pantry with church members. Volunteer in a homeless shelter. Take time to have a conversation with a child in your church or a person in the local retirement community. Serving others is not only a “means of grace” to people you are serving, it is also a “means of grace” for your own spiritual health and vibrancy. When you feel paralyzed by the complicated and insurmountable problems of our world (and there are many! ), go serve and love others. As we continue to see the heart-rending news coming out of Syria—and so many other areas around the world—my prayer is that we would have the courage not to turn away and push down our feelings, as well as the wisdom to know that the full weight of the world doesn’t rest on our shoulders alone. The powers behind mass destruction want us to be paralyzed, and they prey on fear. In the face of fear, the message of our God is one that invites us to participate in the work of hope and love. Nell Becker Sweeden, PhD, is director of Nazarene Compassionate Ministries and an ordained elder in the Church of the Nazarene. Prior to her role with NCM, she was assistant professor of theology and Richard B. Parker co-chair of Wesleyan Theology at George Fox Evangelical Seminary. She is the author of the book Church on the Way: Hospitality and Migration.